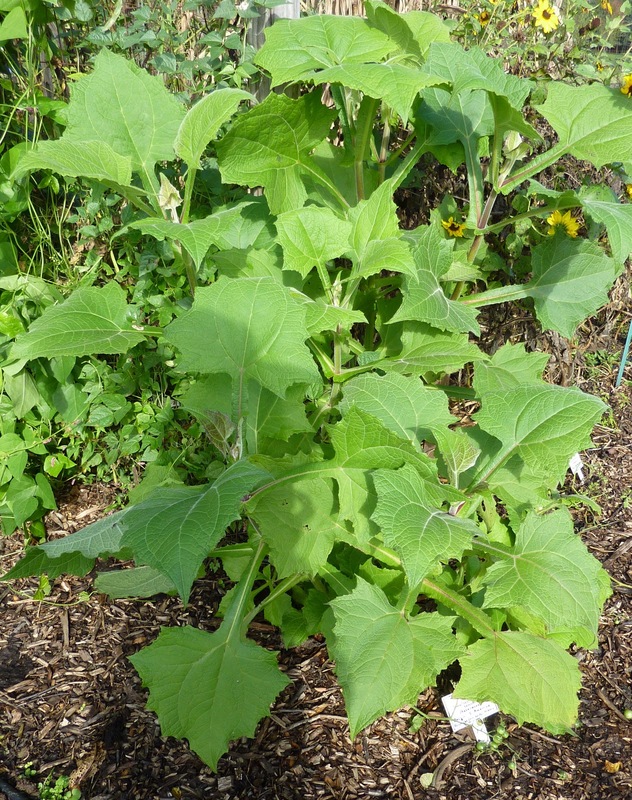 Yacon is a relative of sunflowers, and of Jerusalem artichokes, which also produce edible storage tubers, and in fact of dahlias. They are all native to the Americas and have all been known as food sources for centuries. If this plant had been given a slightly longer growing season, it might have flowered, but yacon does not produce viable pollen or seeds (it must have, once, but has now been cultivated into a non-seeding type) and so must be propagated by dividing of the root crown. (Plants don’t grow from the tubers.) I was given this crown by one of our MGs last year, stored it in a cool room over the winter buried in peat moss, and planted it out in May when it had sprouted. After digging up this plant (it’s not hardy here) I have some good crown material to store and plant next year, and also got a few tubers (next year’s crop should be better). They are easily cleaned with a scrubbing brush, and don’t have to be peeled. 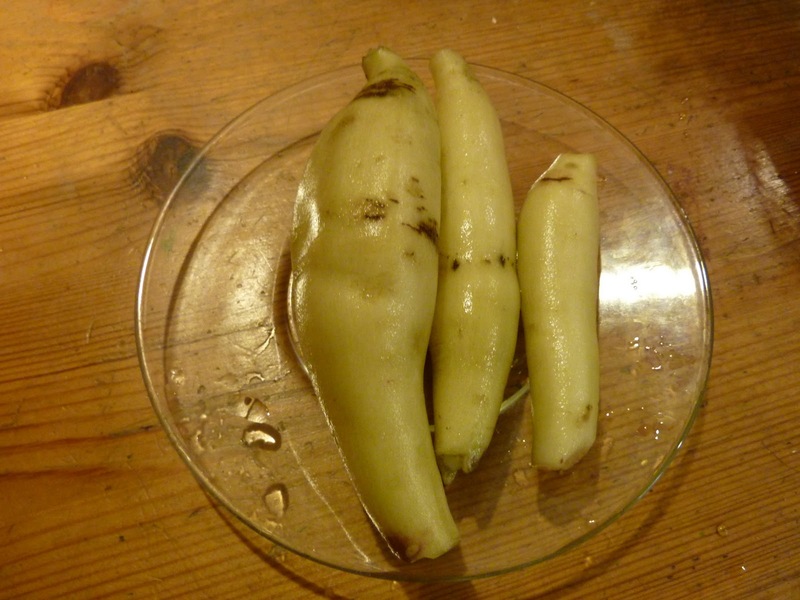 They can be cooked, but for my first time eating yacon I wanted to try it raw – and loved it! Crisp like a water chestnut, slightly sweet and FULL of water: very refreshing. 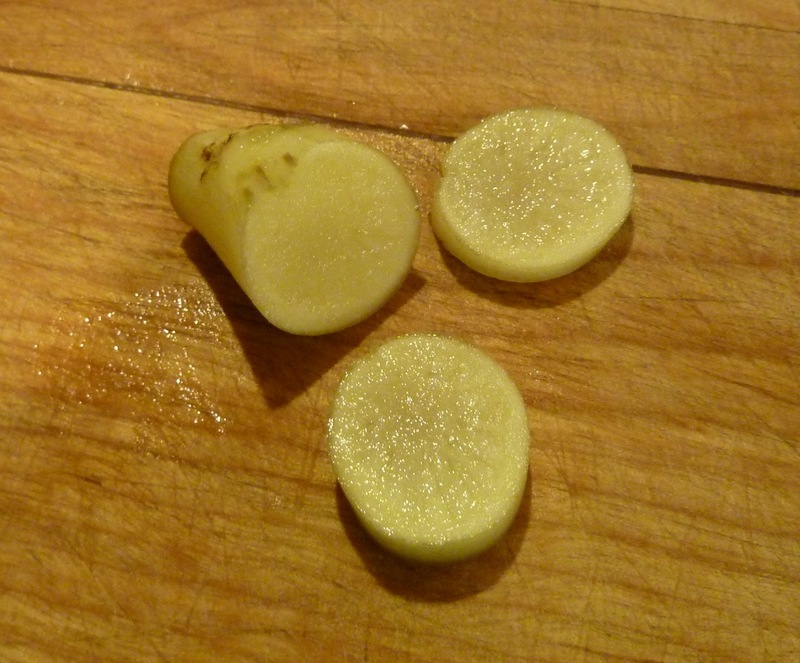 You can kind of see the water beading out of the tuber slices. For more about growing and eating yacon (you just knew I’d have a William Woys Weaver article, didn’t you?) click here and for storage information here. Next, the dahlias. 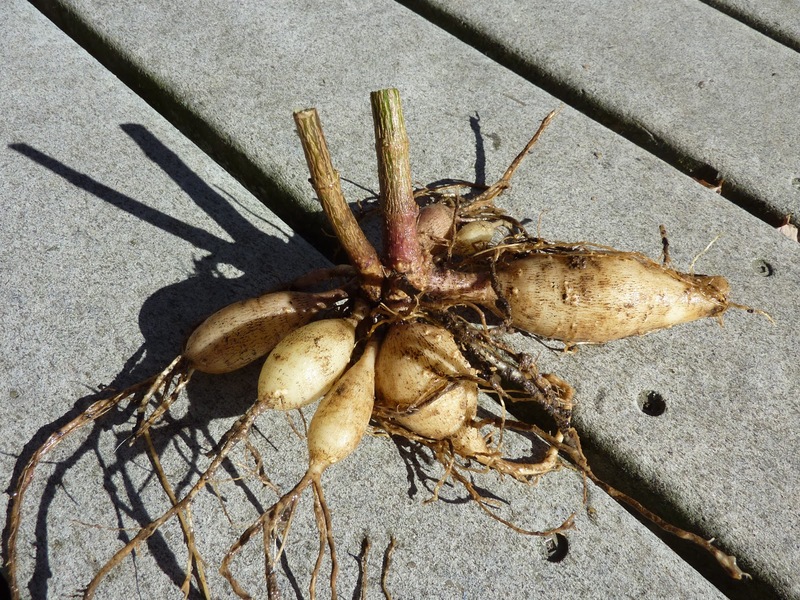 Here’s a dahlia root with tubers attached. This one’s from my garden; we dug a large number out of the demo garden last week, and those are in storage for next year’s garden. Again, you can store them in peat moss in a cool place above freezing. Edited to add: here’s a timely post on the topic from our MG friends in Franklin County PA. With a shout-back to us, how nice! 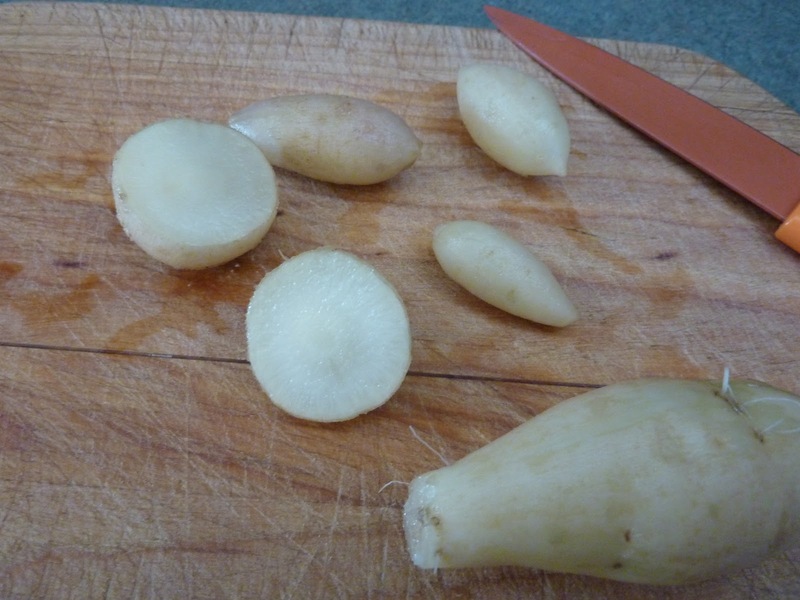 Here’s what the tubers look like cleaned and sliced. I found these, eaten raw, a little less pleasing than the yacon – not as refreshing and more fibrous, with a slightly harsh spiciness. But they are still quite edible and I like them better than I do Jerusalem artichokes. Here’s the article I cited last time for growing and serving information. My advice? If you can get hold of a yacon crown and have a little space (the plants get 3-4 feet tall), try it, especially if you like crisp, sweet, water explosions in your salad. If you already grow dahlias and don’t want to store the tubers, or have one with flowers you don’t like, then eat those tubers too. I think next year’s flowers may be a better bet, though. – Agricultural hazards such as Heavy metals, pesticide residue (if any) are removed by physical methods. i wish to buy yakon tubers for planting.please can you shipped to Roumanie. I'm sorry – we don't sell them!